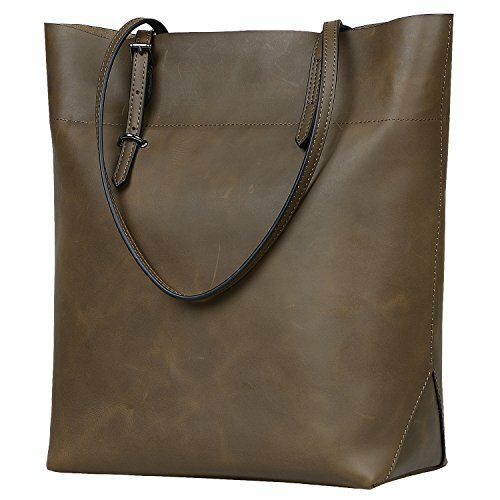 ▶Every tote bags's color may be slightly different in shades. Because we keep the most orginal look of cowhide. Just like there are difference between two leaves in the worlds. The handbags is Unique. SPLIT LEATHER: Made of second layer cowhide leather, vintage crazy horse leather will be more and more glossy after several months of using. Light weight tote bag is more excellent than other bags in same style on amazon. 2 BIG COMPARTMENT&LARGE CAPACITY TOTE: There are 2 divide compartment for 13 inch laptop, books, 1 outer zipper pocket for phone or key,and inner 2 zipper pocket, 2 open pouch. The tote that can hold books, 13" inch laptop, wallet, IPAD, umbrella, cosmetic,clothes and other daily things.Roomy and portable,definitely a good choice to use as work tote, teacher tote,shopper tote or everyday handbag. LIGHT WEIGHT & MULTI-FATIONAL: The Tote's is light and portable, whose net weight is 0.8kg. Zipper top closure, The handbag is a fashion and practical women tote, which can be use as work tote or everyday bag. MEASURE: 11 x 13.8 x 5.5 inch / 28x35x14 cm. Strap's Width :1.5 cm. 6 MONTHS MANUFACTURER'S QUALITY WARRANT If you have any problem after purchase within 6 months,pls go to the order, choose: CONTACT SELLER. We will try our best to support you. If you have any questions about this product by Jack&Chris, contact us by completing and submitting the form below. If you are looking for a specif part number, please include it with your message.